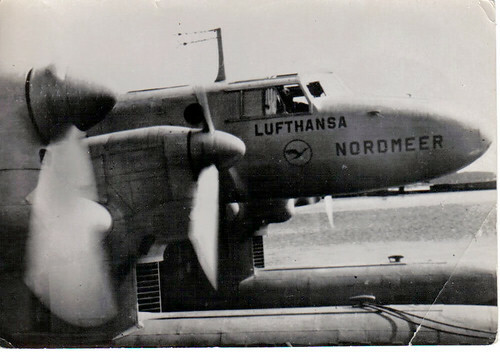 From the foundation of the company in 1933 until World War II, the most important aircraft built by Blohm und Voss was the Ha 139, two of which - the Nordmeer and Nordwind - were delivered to Deutsche Luft Hansa in 1937. Today, the Saturday Air Mail is proud to present the Transatlantic Diesel Mail Service. 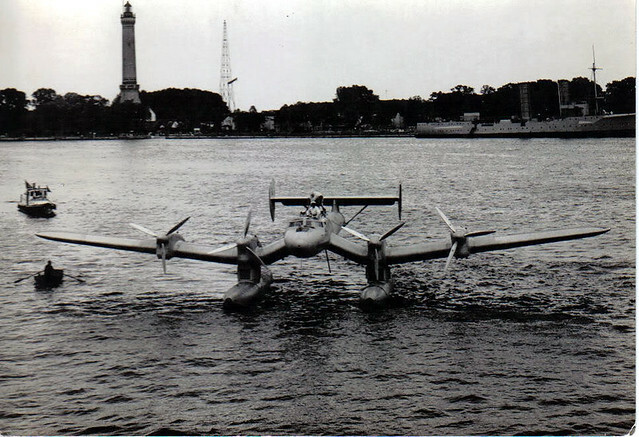 With its four four 447kW Junkers Jumo 205G diesel engines the Ha 139 ("Ha" is for Hamburg) was at the time one of the largest float-equipped seaplanes. The inboard engines were mounted at the joint between the inboard anhedral and outboard dihedral wing sections, above the pylon-mounted floats. 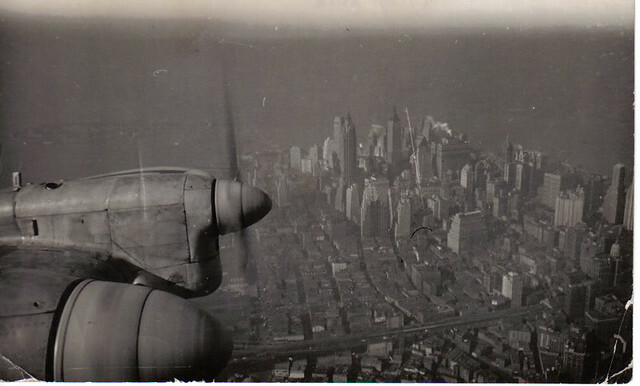 In the summer and autumn of that year they made 14 experimental transatlantic flights between Horta (Azores) and New York. Depot ships MS Schwabenland and MS Friesenland were stationed at each end of the route to provide a catapult launch, which allowed for a higher gross weight takeoff. In the spring of 1938 Nordwind went into service on the regular South Atlantic mail service between Bathurst (Gambia) and Natal (Brazil). Up to the end of June 1939 the seaplanes had successfully completed 100 transatlantic flights: 40 across the North Atlantic and 60 across the South Atlantic. 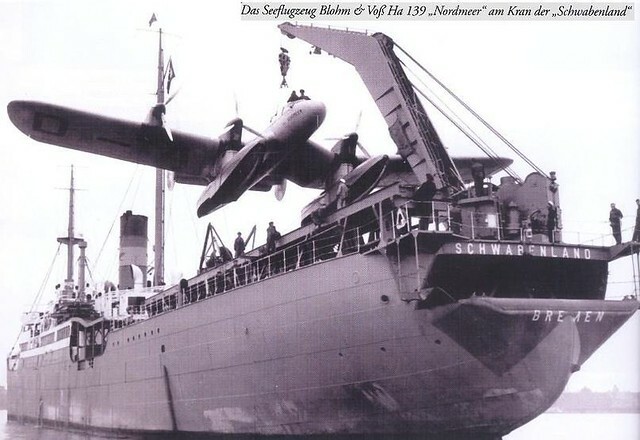 For the 26 transatlantic flights of 1938 between the Azores and New York an improved and larger type of Ha 139, the Ha 139B Nordstern, was delivered. The Ha 139 type was also used to a limited extent during World War II as a reconnaissance, mine-laying and ambulance aircraft. 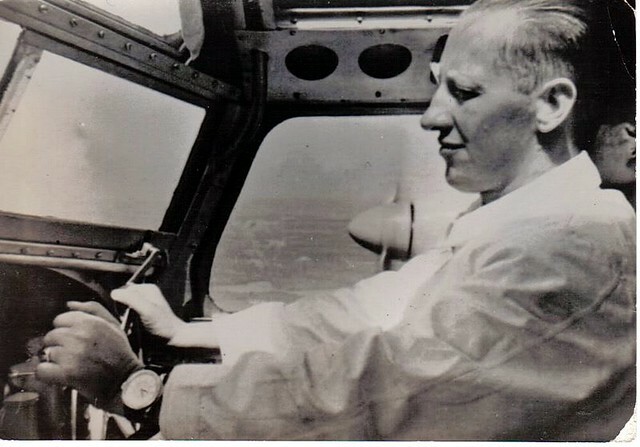 Of course, the BV Ha 139 was not the only diesel-powered aircraft type. We'll see some more.